These chewy, fudgey brownies are made with only 3 ingredients, and are ready in under 30 minutes! I literally only needed to go and buy Nutella from the shop for this super easy recipe – I already had eggs and flour. In fact, you probably already have the ingredients in your kitchen! These brownies are so chewy, and fudgey in the middle, with the perfect amount of chocolate hazelnut flavour. If you love Nutella like I do, you are going to love the smell of your kitchen whilst/after baking. What are you waiting for? Preheat the oven to 350F/176C. Line an 8x8" pan with aluminium foil, then set aside. In a large bowl, mix together the Nutella, eggs, and flour until combined, and smooth. Pour the batter into the prepared pan, and smooth out the top with a spatula. Bake for 15 - 18 minutes, or until a toothpick inserted into the centre comes out clean. Do not over-bake, otherwise your brownies will dry out. Let them cool completely in the pan on a wire rack before cutting and serving. I can’t believe I still haven’t tried these Nutella brownies! Nutella is my new favorite thing! I love Nutella! These have to perfect amount of flavour! Yes please! Love how easy these are!!! They really are, and they’re absolutely delicious! These brownies have been on my list forever. They look so good! Thanks, Dorothy! These are so good, definitely a must-try! Yum, Nutella is SO good and I bet these brownies must be incredible, they look great! Wow! Brownies with only 3 ingredients? I love nutella and theses looks so delicious easy and full of great flavors! Thanks, Anu! These really are incredible brownies! Thanks, Jess! I hope you do try them, they are so good! 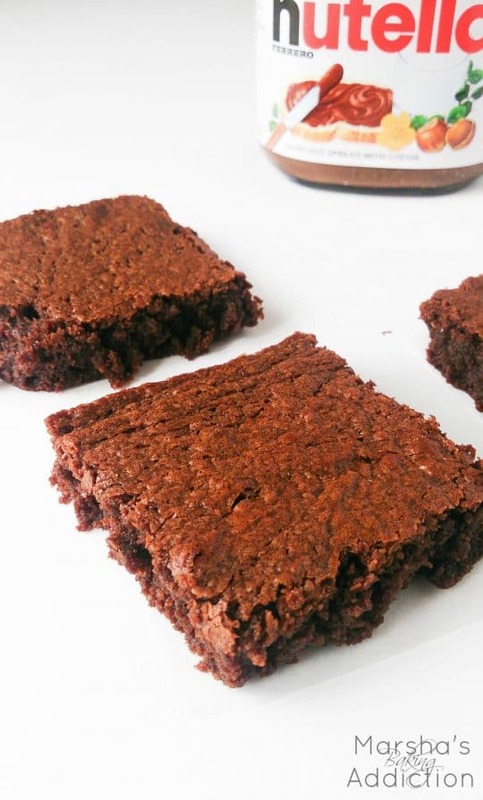 3 ingredient brownies… How awesome! Right? They taste amazing too! Fun! I love recipes with less than five ingredients. These look so soft and good! Btw, do you have a Steam account? What it better than Nutella??? This easy Nutella brownies! Great photos! And thanks for the recipe! We can’t wait to try it out. Whew, this recipe looks dangerous Marsha! 😉 So delicious, I cannot wait to try it. Thanks, Yaya! I hope you enjoy! I love Nutella & I love brownies… Can’t wait to try this recipe! Omg, I think I will have to go out and buy some Nutella for this house! These look great! That looks so moist!!! I can really make anything work with Nutella ha..ha…! Thank you! Nutella comes in handy quite a lot! OMG! I love Nutella and brownies- what better than both in one? I definitely had to YUM these! Wow, these looks delicious! You take really nice pictures as well, keep up the good work!